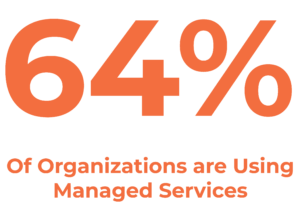 “Managed Services” is a vague term that can cover a multitude of things. In this guide, we will explore the world of Managed Services in the context of IT. In IT, Managed Services refer to a third party IT provider or Managed Services Provider (MSP), managing some or all of a business’s IT needs. As with most business solutions, there is no “one size fits all” answer in Managed Services. A company can outsource to an MSP for one IT need, say Security as a Service, or they could outsource for all their IT needs, with Managed Packages that are designed to act as a full tech team. The aim of this guide is to cover everything a consumer needs to know about Managed Services, from the different types of solutions available to the pricing models providers use. Once you have read the Complete Managed Services Guide you will be able to make an educated decision on whether or not Managed Services are for you. Backup as a Service centers on backups and recovery. With managed backups, all the data stored on your infrastructure will be duplicated and stored on a secure off-site server. The frequency of backups is dependent on the recovery plan. A recovery plan, or disaster recovery plan (DRP), lays out what will happen when/if your digital environment goes down, setting specific expectations for a Managed Services Provider. Recovery plans revolve around the Recovery Time Objections (RTO) and Recovery Point Objections (RPO) that you set with the MSP. The RTO is an easy concept to grasp. It is just how quickly you expect to have your systems restored. The RPO is a little more complicated. The Recovery Point Objective is the age of the files you expect to be restored. A provider will base how often they run backups off of the RPO you set. For example: if you expect the files restored to you after a backup to be no more than an hour old an MSP should be running backups at least every hour. By backing up more frequently you are ensuring that, if the worst were to happen, your most recent work would be saved. With Desktops as a Service (DaaS), a third party hosts the back end of a Virtual Desktop Infrastructure (VDI). So, when you log in to your DaaS, the entire operating system is being run from the MSP’s virtual cloud infrastructure. DaaS can be accessed by software on a computer, or online. Not only is DaaS easy to access, but the VDI ads an extra level of security. It is a great solution for companies who work with very sensitive data, have Bring Your Own Device policies, and/or have a lot of telecommuters. With Data Analysis as a Service, a provider will monitor, capture, and analyze network data to help clients implement more effective business solutions. Proposed solutions can lead to anything from a change in procedure, to an increase in revenue. Managed Communications can streamline employee engagement and makes telecommunication a breeze. Networking and Infrastructure can mean a couple of things. Some Managed Services Providers will maintain servers virtually, conducting maintenance and backups off-site. Others will host and maintain servers in their own data centers or will rent space on their own servers. Knowing which option is best for you rests on how big your company is and/or how much data you are looking to store. Purchasing and hosting your own server is easily the more expensive of the options, considering you have to replace the hardware approximately every 5 years. With Software as a Service, Managed Services Providers distribute applications via the cloud, and then act as the go-between for your company and the software developer. Sometimes you can go directly through the software developer, but by going through the MSP you’re guaranteed to always have the newest updates at no extra cost, and a more personalized customer service experience. It is the difference between buying groceries at the supermarket and ordering them directly from the wholesaler. Support Services cover helpdesk and troubleshooting needs. They are one of the most popular Managed Services on the market. With Support Services, the MSP takes care of everyday problems like password resets, or software updates. Most Support Services will cover mobile devices, tablets, and printers. Some will even provide on-site solutions when necessary. Managed Packages are full service managed solutions, designed to act as an In-House IT team. These packages combine multiple Managed Services solutions. At a minimum, they should involve some sort of security, backup, monitoring, and full Support Services. Choosing how best to handle your business’s IT needs is a big decision, one that can either hinder or advance you professionally. Before you learn any more about Managed Services you should understand how it compares to the competition. The Break-Fix Model: The practice of only calling in IT professionals when there is a problem, or when an upgrade is needed. In-House IT: Employing a designated IT staff or person within your company to take care of all your technology needs. What they each have to offer, and how they compare to Managed Services, are as different as night and day. Break-Fix is a widely dismissed model that can be completely replaced by Managed Services, whereas In-House IT and Managed Services actually play off each other very nicely. Digging a little deeper into each will help you make a wiser IT decision in the long run. The Break-Fix model is simply the idea that when a piece of technology “breaks” you call someone to “fix” it. The rest of the time you cross your fingers and hope everything will be fine. Hoping is not a good business model though, which is why 60% of IT providers have moved from a Break-Fix model to Managed Services. The Break-fix model charges users for consultation, repairs made, and hourly labor. It is impossible to budget for unforeseen issues, and there is no real way for you to know if you are paying a fair price. There are also no preventative measures being taken to avoid future problems, so with Break-Fix, you are leaving yourself open to surprise costs. Managed Services come at a fixed monthly price, so instead of worrying about surprise costs every month, you can easily budget for your IT needs. Most MSPs do require a contract, which can deter some customers. It is important to remember that a contract is just as beneficial to the customer as it is to the provider. An MSP contract will ensure that you’re not only covered in an emergency but that your provider will work to prevent one from occurring altogether. It’s true that with Managed Services you have to put a certain amount of trust in your provider. They will have complete access to your system and will be charged with its upkeep. Some business owners feel safer with Break-Fix because they can control why and when they call for help. 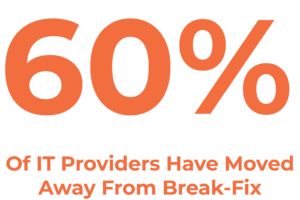 The truth is, Break-Fix requires just as much trust as Managed services and offers much less control. You still have to trust someone with your data, and systems, but you have little to no control over what they are actually doing. An engineer usually just comes in, fixes what is wrong and then sends you the bill. Managed Services Providers encourage collaboration. They want to work with you to find a plan that fits the specific needs of your business. 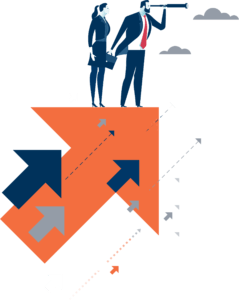 Together, you create a Service Level Agreement (SLA) that outlines everything you can expect from your MSP, including strategic reports, recommendations, and action plans, so you always know what is going on with your systems. The golden rule in IT is that anything that can go wrong will. With the Break-Fix model, there are no preventive measures included. No one is there to catch the issues that start out small but go on to cause serious damage. With Managed Services experts are always monitoring your systems for threats and/or irregularities. Plus, they often offer 24/7 helpdesk support, so if you ever feel unsure about an IT issue you can call, IM or email them. There is also the familiarity factor to consider. With Break-Fix, the engineer who comes to help you won’t be as familiar with your system as an MSP who has been monitoring consistently. You will have to pay extra for them to acquaint themselves with your system before they can even look at the problem. In-House IT, unlike Break-Fix, is widely seen as a great option in the IT world. There is something comforting about having someone on-site, and anyone who has ever had to call a product support line can tell you that sometimes face-to-face interaction is preferable. Many companies have an IT department, or even just one designated IT, person. In many cases, In-House IT and Managed Services work in perfect harmony. 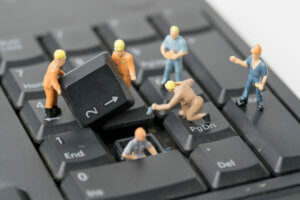 In fact, a CompTIA survey found that only 6 percent of companies who adopted Managed Services laid off any IT staff. There are a variety of benefits that come from a partnership with a Managed Services Provider. The responsibilities of In-House IT staff aren’t just maintaining and fixing technology. So much of what In-House IT experts do is about finding ways their organization can boost productivity, nurture growth, and perfect its product or service. All too often IT staff is wasted on menial help-desk duties when they could be focusing on big-picture items. 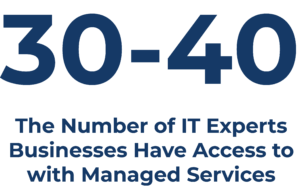 This is where a Managed Services Provider can help. Rather than replacing In-House IT with an MSP, you can use Managed Services to pick up slack and take care of everyday tasks. Day-to-day IT management, such as help desk or updates, is so time-consuming that it’s common for in-house professionals to have little to no time for developing new projects. Your IT expert’s time would be better utilized focusing on business development rather than resetting passwords. No one is an expert at everything, and even the most talented IT whiz will have holes in their resume. Maybe you have an engineer that is amazing at programming but isn’t the best at network management. Rather than hire a whole other employee to fill that gap, you can outsource your network and infrastructure to an MSP. You will save money, and free up your programmer to focus on what they do best. Outsourcing also gives in-house staff access to the latest technology. 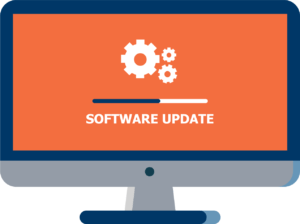 Staying on top of software updates and new tech can be all-consuming. MSPs can help your In-House IT by managing all your third-party software, from cloud solutions to email. The cherry on top being you have local customer care if something goes wrong, versus spending hours in the phone tree of a large software conglomerate. As nice as In-House IT can be, not all businesses actually require it. At a minimum, having just one full time IT staff member can run a company $40,000-$60,000. If you are a small business or even a medium-sized business that doesn’t rely heavily on technology, that price might be unjustifiable. Managed Services can provide you with all the support of In-House IT, at a fraction of the price. As your company grows, and you find the need to hire a full-time staff member, you can simply scale back your managed solutions to find that sweet spot of support. Before you partner with a Managed Services Provider, or any provider for that matter, you should sit down with them to find out what they are really bringing to the table. Here is a handy list of ten questions to ask a potential MSP before signing a contract. Unfortunately, in today’s cyber-centric world, an IT disaster is practically inevitable. When investing in Managed Services, it is essential that you find a provider that is prepared for disaster. Any MSP worth its salt will be ready to talk to you about a disaster recovery plan, including the recovery point RPO and RTO that you want to set. In laymen’s terms, they will either have a recovery policy in place, or they will be ready to work with you to create a customizable plan. If the potential provider does not have an answer it is time to move on to the next. Asking this early on is the best way to protect yourself from hidden fees down the road. Having a clear idea of what you need is going to save you a lot of time because Managed Services Providers can differ on how they provide said services (some have all-encompassing suites and others offer solutions À La Carte). Lay out exactly what you are you looking for from a provider, and then have them clarify how they are going to charge you for it. Don’t accept one lump sum. Insist that they break things down for you. Find out if they put limits on their products, such as the number of times a week you can call the help desk or the number of devices covered in a plan. You do not want to be hit by surprise fees at the end of the month. Admin Portals: Some MSPs provide admin portals where you can go to get a quick snapshot of what is going on behind the screens. Often, based on the service, portals will include user management controls. Troubleshooting: Do you want your MSP to come to you when there is a problem to propose solutions, or do you just want them to handle everything? Maybe there is a middle ground that suits you? A large part of any enterprise is growth. When deciding on a Managed Services Provider, you want to choose a company that will make expansion easy. As you evolve, you will naturally accumulate more staff, so you want an MSP that will make it easy and affordable to add new workstations, employee accounts, or locations. Depending on your industry, you may want to look into scalable solutions as that can accommodate increased data. It is better to be prepared for development now than to be held back in the future. Technology, like your business, is set to change. That is why questions four and five are closely related. You need a Managed Services Provider that is adaptable to both growth and change. A good MSP should have an affordable plan to ensure your company is as up to date as possible. If they don’t, they stand to be a potential deterrent to you in the future. It isn’t enough for a provider to offer you today’s cutting-edge technology, you need to be sure that they will keep you on that cutting edge. A Managed Services Provider who doesn’t adequately care for their own infrastructure may nor care for yours properly. This question will give you an insight into the level of attentiveness you might expect from the MSP and let you know if maintenance and updates will affect your productivity. (If there is downtime, will someone alert you ahead of time, and how?) Furthermore, take this opportunity to confirm with your provider that there will always be a way to reach them. You do not want to find yourself in a position where your managed solution is down and you cannot reach your provider. Additionally, it’s important to know what the operating hours are for the helpdesk. You should have a 24/7 helpdesk service because technology never sleeps, and neither does commerce. If your entire email network goes down on Christmas day you are going to need to call the helpdesk, and if no one is there because you didn’t invest in a 24/7 helpdesk system, you are going to kick yourself. While on the subject of data, see if your MSP is planning to collect any behavioral data and if so what they plan to do with it. Remember back at the start of 2018 when everyone found out that Facebook had been selling personal information? Well, Facebook isn’t the only company that does that and it is doubtful that you would want someone selling behavioral data harvested from your employees. On the other hand, a provider may just use that data to improve their offerings, in which case it may not make a difference to you at all. Either way, your organization’s data is precious and you absolutely have to know what a potential partner plans to do with it before you just hand it over to them. Another great thing to ask a possible MSP about their team is “How do you evaluate employee candidates?” A provider that stands behind their staff won’t have any problem divulging their hiring process. If you still feel like you are getting a canned response, push a little harder, and force them to dig a little deeper. Why them? What makes them different from the dozen other MSPs you could choose from? If they haven’t provided one already, request a customer testimonial. The best representative for a service is an existing customer. 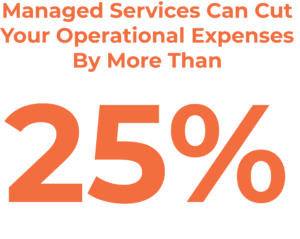 Obviously, the actual prices of Managed Services are going to contingent on a number of variables, like the provider, the specific service you want, the size of your company etc. What can be more predictable is the pricing model used by an MSP. Provided are five of the most common pricing models used by Managed Services Providers. Flat Rate: One flat rate for the entire service, usually charged monthly, quarterly, or sometimes yearly. À La Carte: You pick and choose which aspects of a service you want, and pay for each of them. By Device: You pay a flat fee for each device you want to be covered by the service. By User: You pay a flat fee for each user you want to be covered by the service. Hourly: You pay a flat fee for every hour you use the service. More often than not, providers use a combination of pricing models. For example, if you are paying for Support Services, there may be one flat rate for the solution, with an additional hourly rate for Helpdesk issues. 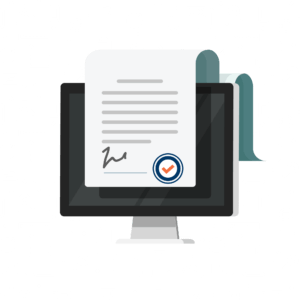 A Service Level Agreement (SLA) is a document that lays out the responsibilities of you and your Managed Service Provider. For some providers, they are built into a contract, and for other’s they act as the entire contract. They are a necessity because they outline everything from mutual expectations, to indemnification. Without one, both parties are left open to legal ramifications. SLAs are legal documents, therefore you should always review them with a lawyer. A lot of MSPs have standard agreements that they use for every client. There is nothing wrong with a standard SLA, but it shouldn’t change the way you approach the situation. If a provider comes to you with one, you and your legal counsel still need to review it. What is standard for them may not work for your company. Below is a general overview of what you can expect to see in your service level agreement. 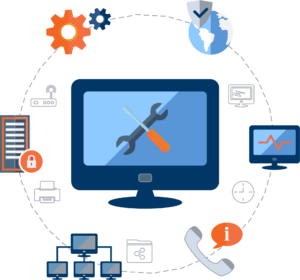 Provided Services: A complete overview of the products and solutions you, as the client, can expect from your Managed Services Provider. Don’t accept any vague terms. Miscommunication can lead to hidden fees or even worse, unresolved issues. Problem Management: Problem management covers how you and your new managed service provider will handle issues as they arise. Responsibility: What problems are you responsible for, and what problems is your provider responsible for. Reporting: Reporting procedures should be very clear to both you and your provider. When things are not reported properly they go unnoticed, because you can’t expect your MSP to solve problems they don’t know exist. Escalation: Not every IT problem is the end of the world, but as a business owner it can often feel that way. Making it clear to your MSP what problems constitute an emergency will ensure that the important things are addressed immediately. That doesn’t mean that they will ignore the smaller problems, it just establishes an order of operation. Resolution: How quickly you can expect problems to be resolved once you have reported them. Availability is a big factor of resolution. For example, if something happens outside of the MSP’s “normal business hours”, how much longer will it take them to fix the problem? Don’t leave anything up to interpretation. Performance: This part of your SLA defines the level of service you can expect from your Managed Services Provider, and how that performance will be measured. First, you and your provider need to agree on what metrics you will use to measure their work, how those metrics will be reported, and who will be reporting them. Once you have decided on the metrics, you and your MSP will be able to establish performance expectations. Legal Fine Points: Iron out those legal fine points, including things like warranties, indemnification, exclusions, and how to handle third party claims. Once again, make sure to consult legal counsel. Scalability: Businesses grow, and needs change. At some point you and/or your Managed Services Provider may find it necessary to change or update your SLA. While that is all well and good, the agreement shouldn’t be altered for just any reason. Establish some scalability in your agreement, so that it can be altered, but only for the right reasons. Termination: Although this is a basic part of any contract, it can feel a little bit like discussing divorce at a wedding. In the long run, though, setting termination terms for your partnership with a Managed Services Provider will protect you both down the road. The majority of Managed Services are delivered virtually, via the cloud. The end user will sign in to a portal or download software that will loop in the provider. The only downside to the cloud is that the service is completely reliant on the Internet. If there was some network disruption an MSP wouldn’t have access to their client’s environment. The alternative is a Managed Services appliance, which is a physical device installed in/on a client’s infrastructure. This practice is pretty rare and is usually reserved for more complex solutions, such as Security as a Services and Backup as a Service. With so many versatile options and the business world’s ever-increasing dependency on technology, it is no wonder the Managed Services market is growing so fast. According to a recent report by Markets to Markets, the Managed Services Industry is set to grow over $100 billion dollars in the next five years, and a similar study by CompTIA found that nearly two-thirds of organizations are using Managed Services for at least one IT function. Clearly, Managed Services is making a big splash in the IT world, and for good reason. Not only do MSPs provide a wide range of features, but they also out benefit the older IT outsourcing models, and perfectly compliment In-House IT staff. Does that mean they are right for your business though? While you are the only one who can answer that question, we have provided a list of ten helpful considerations to take into account when mulling over your Managed Services options. As a growing business, do you see your IT needs elapsing your current IT solution? Are you looking to move your data to the cloud, or thinking of switching to cloud-based software? Is your business large enough to justify a full In-House IT team (troubleshooting, security engineer, software development etc.)? Do you feel like your In-House IT team could use extra time to focus on big-picture projects like business development, strategic efforts or employee productivity? Are you currently without a disaster contingency plan for your data? Do you like the idea of a fixed monthly fee for all your IT needs? Could your employees benefit from a more collaborative and flexible communications system? Do you have telecommuters? Would you like to in the future? Does your Company work with sensitive data? Are you looking for an easier way to meet industry standards, and provide compliance reports? If you answered yes to one or more of those questions you may want to explore Managed Services further. The OTELCO Cloud and Managed Services team can help you assess your current IT environment and future needs. 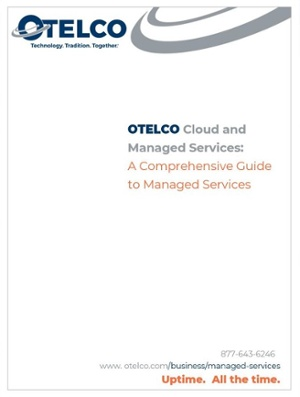 We have covered a lot in this guide, and hopefully, you know a good deal more about Managed Services now than you did going in. If you are seriously considering a Managed Service solution, it may be beneficial to schedule a complimentary Managed Services Consultation. Establish your existing technology environment. Determine your business unique technology needs. Find the most cost-effective solutions. Gauge your ability to manage those solutions.